Altars are sacred space that Pagans and those who practice witchcraft use to work magic, spells, give thanks, ask for blessings, do rituals and rites. The altar is within a sacred circle that is created by the participant of one or more of the above. 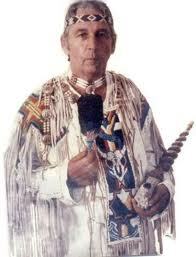 Creating a sacred circle will be another article at some time in the future. Here we will discuss various altar tools that are used on the altar and within the sacred circle. I would like to note that tools are not required to perform any type of sacred work, as visualization can be employed. Altar tools are used to help us create focus for our thoughts and energies while working within the sacred space. An altar can be any space you set aside for work as mentioned above. Some folks use temporary altars and take them down after using them. This is especially true for those who cannot openly display that they are of a Pagan path. Others have a more permanent setup, such as a table or counter where they leave everything in place after doing their sacred work. We are in this category. Our altar space is in our living room on a table we had donated to us, a rather nice, old wooden coffee table. It is large in the eyes of some, however, it seems that we have out grown it at times! Athame - An athame is a ritual knife/dagger. A sword may also be used in the place of an athame. You can purchase an athame, or use a favorite knife of your own. Once you select which to use, you need to cleanse it and only use it on the altar. An athame is used in the sacred circle for various purposes. Most commonly it is used for directing and banishing mystical energies and summoning. It will also be used to create, open and close a sacred circle. Your athame is never to be used for cutting, stabbing or a weapon. It is your magickal tool used specifically for magickal purposes only. Cauldron - Most of these will be cast metal, usually iron with three legs. They represent the feminine energies and can be used to burn herbs, mix herbs, hold candles and also, as we use one for, to place prayer requests in. About once a month or so, we burn off the requests that have built up in the cauldron. Censer - There are many types of censers out there. The choice is up to you on what type you may use. We have censers that hang, that sit on the altar and a bowl of salt that we place stick incense in. Chalice - A chalice is used to hold various liquids. Most commonly you will find that it is used to hold water and is symbolic of the element of water. The chalice can be made of any substance, however many will use ones made from metals. Silver and silver plated are common. A second chalice can be used for holding wine that may be used within your sacred circle. 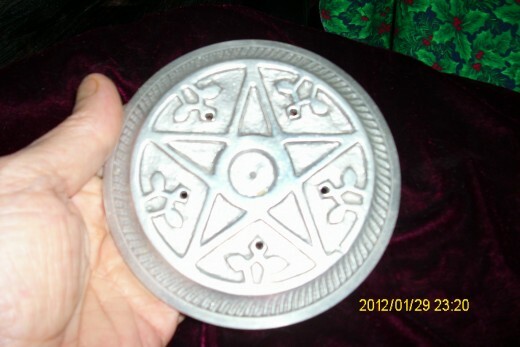 Pentacle - This is a five pointed start that is set within a disc or saucer. Pentacles are used for protection and also used to consecrate various altar tools such as your chalice and censor. You just place them on the pentacle. The Mother Goddess is represented by the pentacle and is symbolic of the element Earth. They can be made of metal and wood. You can make your own using a piece of wood and carving your own pentacle on it. Salt - Salt is usually placed within a bowl and represents the element Earth. Many people will use sea salt, however, I have found all salts work. Salt is a very powerful tool for purification and ridding your area and tools of negative energies and vibes. Candles - As an eclectic Pagan/Witch, it has been my experience that Pagans have to stock up on many candles! Fortunately they are not expensive, but they do add much ambience and spirituality to your altar and sacred space. Commonly a white candle is used to create a source of light on the altar, but many will use a colored one that corresponds with the deity or desire that you may be working with at any particular point. Four candles are used in the four corners of the altar that represents the four elements, Earth, Air, Fire and Water. Colors are associated with all aspects of altar candles, however, I have found that any color will work as long as they are charged with the proper intent. I will not go into specifics on colors, uses and further placements due to the large amount of space needed for such. This is a thought for a future hub. Tapers are best used on the altar however votive candles and tea candles will work just as well and are less expensive. Candle Holders - Candles need holders without a doubt. Any type of holder can be used. I have found that glass works well and is easy to maintain and cleanse. Also, picking up some unique holders at various thrift stores and such is great! As with any tools or items introduced into your sacred space, always cleanse them first. I would advice against using wood for holding your candles for obvious reasons. Wand - Us witches really do use magickal wands! The wand is a symbol of the element Air, however some traditions use it as being symbolic of the element Fire. The use of the wand is to direct mystical energies. Altar Bell - At times your ritual may require the ringing of a bell. There are many types of bells, but what works best is a small bell that can be lightly struck to get that subtle ringing noise. There are many other items you may find on an altar, but this is a good list to start with. Some Pagans will wear a cloak that can be bought or handmade. Also, you may find a second knife on the altar which is used to carve on candles as well as cutting up of herbs. This knife is called a boline. A candle snuffer is always a great tool to have as well. Using a snuffer shows more respect to the elements than blowing a candle out. A Book of Shadows is commonly part of the tools found on an altar as well. This is a journal that is kept for spell work, your magickal experiences and various insights you may have. In the past the Book of Shadows was always handwritten, and that tradition is still carried over today by many. Others have taken to using the computer to create their Book of Shadows and then printing it out and placing it within a journal or binder as well as saving it on disc and such.